Hey guys I came up with an OS which gonna be my 3rd number. 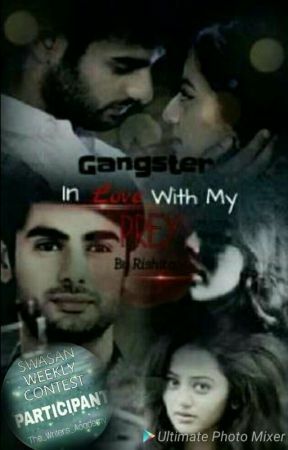 I&apos;m writing this OS for the contest "SwaSan Writer&apos;s Contest (Weekly) " the author of this contest is The_Writers_Academy. Hope you like it including all my friends . Gangster - In Love With My Prey. A big bungalow is shown. Many guards are seen guarding the place. A car stopped in front of the gate and a girl of mid 25 comes out. The face is revealed as Swara. Guard : Good Morning Ma&apos;am. Swara (smiles) : Good Morning. Swara enters inside the bungalow and found a man sitting on the couch and was drinking wine. Swara : You called me Laksh ? Laksh : Yes. Actually you have to complete a work for me. Swara (confusedly) : Work ? Laksh : Hmm. You have to kill a person. He is very well known in this city. Though he is not here now but after an hours he will land in Mumbai. You have to kill him immediately when you see him. Okay ? Swara : But who is that person ? Laksh : You will be sent a picture with location after an hour. Swara (sighs) : Okay then. I take my leave now. Swara makes exit from there whereas Laksh smirks. Laksh : Mr. Sanskaar Meheshwari welcome to Mumbai. Though you are coming here but cannot go back. Today will be your last day. Because of your so called honesty my brother went to the jail. From that day I was waiting to take revenge from you and today I&apos;ll fulfill it. (Laughs evilly). Sanskaar (shouts) : I am back Mumbai !!! Yeah !! A man of 50&apos;s came to him and greet him. Sanskaar (with disappoint face) : Ramu kaka how many times will I say that don&apos;t call me sir. I&apos;m younger than you. So please. Ramu kaka : Achha Sanskaar baba sorry. Now come your car is waiting. Sanskaar : Okay. But for now you will sit at the backside. I&apos;ll drive the car. Sanskaar : No ifs and buts. Will you sit or I go home by walking ?